The halo AirStep Kitchen Trash Can provides the smoothest step trash can experience you'll feel like you're stepping on air! The precisely weighted lid provides just the right amount of resistance on the durable pedal, so minimal force is required to open the lid. The lid closes silently and gently, and the replaceable air damper means this trash can will perform like new for years of use. 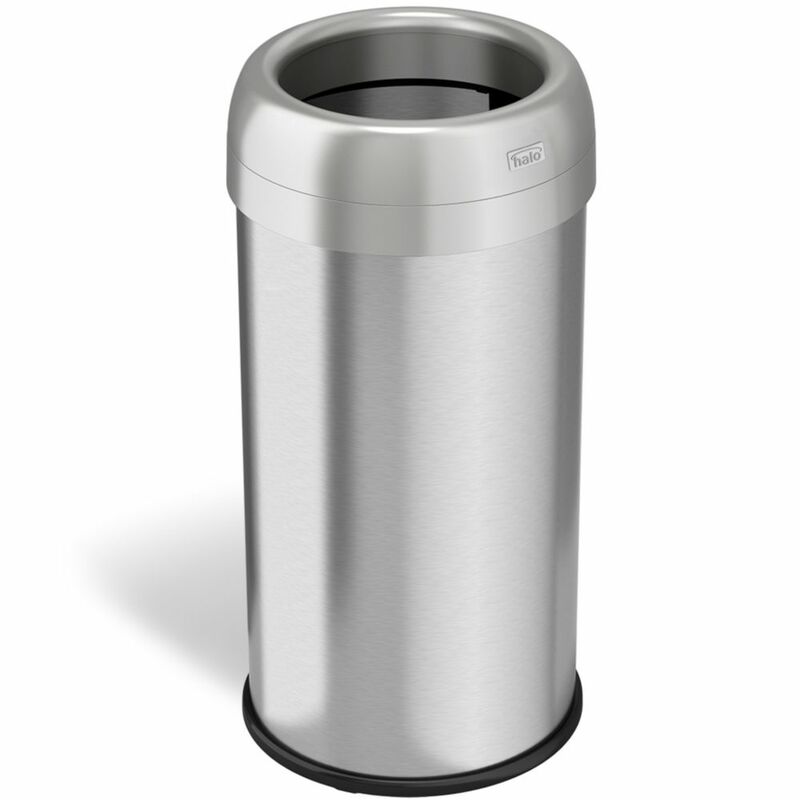 Honey-Can-Do TRS-01159 2-Tone Stainless Steel Step Trash Can, Round. A contemporary addition to any home or office, this 5L (1.3 gallon) trash can is the perfect size for a bathroom or home office and boasts sturdy construction for daily use. A steel foot pedal provides hands-free operation to keep germs at bay. A plastic inner trash bucket is fully removable for easy emptying and cleaning. The brushed stainless, hand print resistant exterior is easy to clean and features a metal fold down carrying handle. 16 Gallon Open Top Round Trash Can with Deodorizer This 60 Liter Dual-Deodorizer Round Open Top Trash Can is the perfect size trash can for lobbies, dining areas, stores, or any high traffic venue. It features a large open top with an easy to clean cylindrical fingerprint-proof brushed stainless steel body design that allows it to fit easily into any space and easy to keep clean. It also includes two activated carbon filters designed to keep odors out of the surrounding area. The wide opening easily accommodates large and bulky items. Its 60 liter / 16 gallon capacity can easily retain more than a day's worth of trash. Its elegant, brushed stainless steel finish is smudge-resistant, easy to clean, and complements any setting. 16 Gallon Open Top Round Trash Can with Deodorizer is rated 4.5 out of 5 by 2. Rated 5 out of 5 by HomeDepotCustomer from Great quality and price. Love the top. As stylish as... Great quality and price. Love the top. As stylish as you can get for a trash can! Looks great in the conference room. Rated 4 out of 5 by CA from Looks great. Convenient opening for use by a large group = no backup or spilling of trash. Grea... Looks great. Convenient opening for use by a large group = no backup or spilling of trash. Great product.